SharePoint Designer contains a number of different editor programs that are used for SharePoint Online development. For example, when you develop a page, you’re using a Page Editor. If you’re developing a workflow, you use the Workflow Editor. The tool fits the job. Page Editor: Use this editor to develop pages. For example, when you want to develop a new content page, you use this editor. Workflow Editor: This editor is designed to develop workflows. Do you need to create a workflow that sends a new proposal off to your 15 executives for approval and tracks their feedback? This is the editor you use to do it. List and Library Editor: Use this editor to work with Lists and Libraries. When you need to work with the views, forms, workflows, and content types that are attached to a list or library, this is the editor you use. Content Type Editor: Developing content types often takes patience as you figure out exactly which columns for metadata you want to include. When you need to develop a content type, however, this editor is the one you use. Column Editor: The column editor lets you develop metadata columns for your SharePoint libraries in a single interface. When you need to configure the columns on your site, this is the editor you use in SharePoint Designer. Script Editor: When you need to develop code, such as Cascading Style Sheets (CSS) or HyperText Markup Language (HTML), you use this editor to get the job done. The editor is actually nothing more than a glorified text editor with some nifty features, such as turning key words different colors, to help you identify key words syntax. Image Editor: The image editor is an image manipulation program that you can use to modify your images. You can change the brightness, contrast, and color or even crop, rotate, or flip the image. 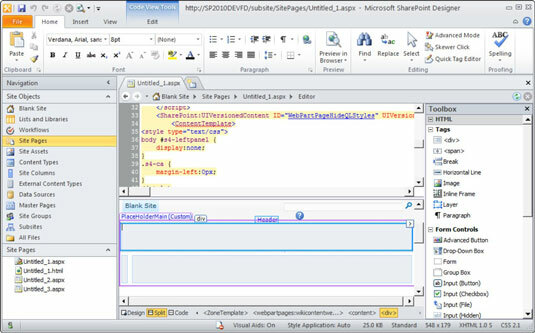 Text Editor: This editor is similar to using Wordpad or Notepad but without having to leave the SharePoint Designer application. Need to edit a text file on your SharePoint site? You can use this editor. XML Editor: The XML editor is similar to the script and text editor but provides some nifty functionality for getting the syntax and formatting of eXtensible Markup Language (XML) documents correct. External Content Type Editor: Just like the Content Type editor is used to work with content types, this editor is used to develop content types that are external to your SharePoint environment. An example of an external content type might be a grouping of metadata that is stored in your backend Line Of Business (LOB) system that you want to interact with in SharePoint. The external content type would contain the connection information, the details of the metadata, and how SharePoint should use it.